The first days of the Miami Open provide a great atmosphere to watch the stars of the WTA relax and practice before the chaos ensues later in the week. That said, Day 2 of the Miami Open offered a chance to see the completion of the qualifying competition and beginning of the first round for the ladies. 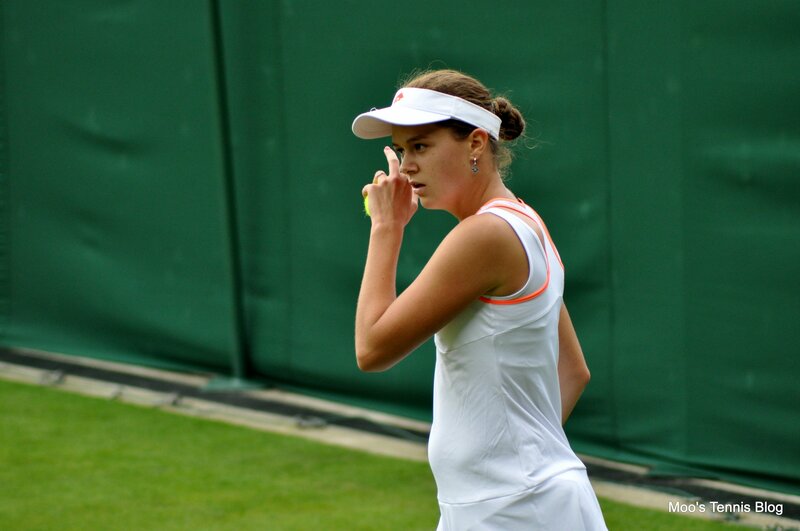 I started the day watching the first round encounter between Lara Arruabarrena and Natalia Vikhlyantseva. When I arrived, the Spaniard had just broken the Russian’s serve to take a 6-5 lead in the opening set. 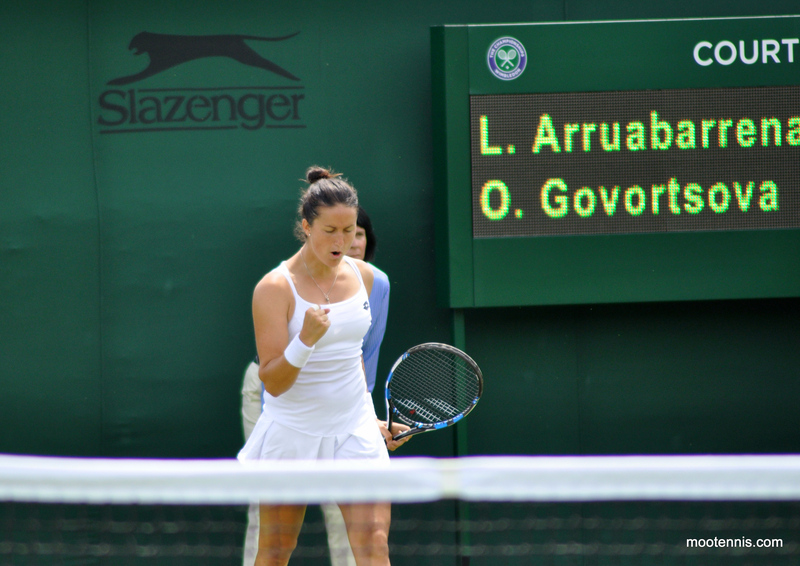 From this point in the match Arruabarrena took control, winning 7 out of the next 8 games to take the match 7-5, 6-1. Arruabarrena’s spin and variety were too much for an extremely erratic, Vikhlyantseva. It’s a shame because since starting her season off with a main draw win in Australia (after coming through qualies) and reaching the semifinal of Saint Petersburg, the Russian has been unable to win a match (besides beating Darija Jurak – a doubles specialist). I think the Russian has the tools to play well, but I was puzzled by her forehand technique. Even though she gets her racquet head back early, she still seems to be late in making contact with the ball. Also, she doesn’t seem to rotate her shoulders on the follow through, possibly limiting the amount of pace she is able to generate. I don’t think the Russian’s game will ever be suited to Miami, given the slow and heavy conditions, and think she will find most of her success on fast indoor or grass courts. To her own frustration, Vikhlyantseva made error after error, only sprinkled with some well-played points in between. On the other hand, I was impressed with the effectiveness of the Spaniard’s game; she played some sublime defense, used top-spin and slice shots to her advantage, and played off the pace of the Russian. I think that Arruabarrena has a chance to cause an out-of-form Begu some trouble in their second round encounter. Next, I headed over to court 1 to watch a little of Naomi Osaka’s first round match against Kristina Kucova. There’s not much to say about this one, as Kucova doesn’t really have any qualities that could hurt the young Japanese woman. This coupled with the fact that she is playing for the first time since Melbourne (injury I believe) made the match particularly one-sided. That being said, I am impressed with the way Naomi was able to use controlled aggression, as it really reflects on the way she’s been putting together a consistent season. I am looking forward to Osaka’s second round encounter with Halep, and given the Romanian’s current form, believe that this draw presents her a huge opportunity to possibly make the quarterfinals, as the other seeded players (Ekaterina Makarova, Caroline Garcia, and Samantha Stosur) have all been struggling with form. However, two unseeded floaters, Peng Shaui and Ashleigh Barty will not make it an easy task. With Osaka up a set and a break, I went over to Court 5 to watch the qualifying match between Anastasia Potapova and Jana Cepelova. Potapova was coming off a huge win over Sakkari (more details in day 1 recap) and I was curious to see if she could maintain such a high level. The start of the match was extremely competitive, with both girls hitting extremely hard from the baseline and constructing some excellent points. However, a double fault at 3-4 from Potapova gifted the break to Cepelova, and seemed to heavily shift the momentum in the Slovak’s favor. Cepelova played an excellent match which saw her paint the lines with an abundance of winners, as well as use excellent variety. Potapova did not play poorly at all but was simply not given the chance to get into the second set given the play of her opponent. Cepelova is one of my favorite players, but I have become disillusioned with her given her inconsistent results. I am interested to see if she can keep up this form against a more established opponent in Andrea Petkovic tomorrow. One thing I did notice about the young Russian’s game is that she did sit down during the entire changeover and did not waste time pacing around the court during today’s match, a good sign that she can in fact keep her energy under control. After Cepelova’s victory, I decided to walk over to Grandstand court and end my day watching Belinda Bencic against Sara Errani. I should note that I saw Laura Siegemund who seemed to be pretty distraught on the phone. I am worried that her loss to Duan today (and her otherwise poor start to the season) will have a serious effect on her. After all, she does have a lot of points defend with last year being her first consistent season at the WTA level. Anyway, I got to Grandstand court as Bencic had just lost the first set to Errani. Fair warning, Errani is one of my least favorite players on the WTA tour. While I respect her defensive abilities and tenacity, I find her serve inexcusable. Bencic was playing pretty horrendously at the start of the second, making error after error to fall behind 3-0. However, she quickly turned it around and with some better timing, was able to hit through the Italian to win the next four games. Showing flashes of what took her to the top 10, Belinda won the second set 6-4. It was clear how much this match meant to both players (who have both recently fallen out of the top 100), as both were loud and emotional. In the third set, Bencic resorted back to the level of play she was playing at the beginning of the second, making more unforced errors and not seeming to think about constructing points. It would be unfair to Errani to suggest that her defensive abilities did not play a role in frustrating the Swiss, and she hit an excellent drop shot/passing shot combination to close the match.
.@SaraErrani books a spot in @MiamiOpen Second round! I am nervous for Belinda as I don’t think she is playing horribly, but rather that she has gotten a couple of bad breaks with her draws this year. I think that this draw presented her an opportunity, but she was too low on confidence and match play to capitalise upon it. I am curious to see what her post-Biel scheduling is like, and hope she considers dipping down into more international or ITF events (such as Cagnes-Sur-Mer and Trnava in place of Madrid and Rome). TBH I don’t think BB is even fit enough to play at the level that got her into the top 10. She must have gained 10 pounds since then. Wants to end the rally in <5 shots. Surprised no one is mentioning this. I have to agree and I mentioned this on the review that James did. Belinda really she needs to work on her fitness/diet and get herself in better shape. But, Shelby Rogers who appears to be less fit than Belinda keeps winning matches. Thanks for your report on Vik—–seva. I thought she could be a future star after the St. Pete tournament, then she lost match after match to low ranked players. Shelby has only won more than one match in five of her last six WTA events before this one so she is not playing that well either. Another reason why Belinda is struggling is because she appears to be lacking in confidence. Belinda has decided to play in an ITF event next week so I hope that she will do well and give her confidence a boost.